Today, I'm reviewing the classic French film L'Atalante (1934) starring Dita Parlo and Jean Dasté as a newlywed couple. This article is part of the France on Film blogathon hosted by Serendipitious Anachronisms. If, as I believe, cinema is the greatest art form of the 20th century, then the 1934 French film L'Atalante is one of its supreme achievements. Director Jean Vigo's poetic realism masterpiece is not only a hymn to love, but it is also a celebration of the resilience of the French people, and the greatest artistic statement from a young auteur who died too young. L'Atalante tells the story of Juliette (Dita Parlo) and Jean (Jean Dasté), a pair of newlyweds who barely know each other. Juliette is from an isolated small town and she impulsively marries Jean, who operates a barge on the Seine River named L'Atalante, so she can see more of the world (Juliette is especially keen to see Paris). However, Juliette has a hard time adjusting to life on the barge where she must live in close quarters with the eccentric, slovenly first mate, Pere Jules (the great actor Michel Simon), a young cabin boy (Louis Lefebvre), and a menagerie of stray cats. Eventually, because of a series of misunderstandings, the lovers become separated, and their spiritual pain becomes more intense as they search the streets of Paris in vain. L'Atalante is Vigo's first and only feature film. Vigo, who was a self-taught wunderkind, had made a huge splash with the short film, Zero for Conduct (1933), about a strict boarding school much like the one Vigo attended as a young man. For his next film, he wanted to make a movie about famous anarchist Eugene Dieudonné -- Vigo's father was a noted left-wing agitator -- but producer Jacques-Louis Nounez felt that idea did not have commercial appeal. Instead, he gave Vigo an original story by Jean Guinée about barge workers, which was a popular theme in pop culture at the time, especially in French music. Vigo and Albert Riéra rewrote the script, but the actual plot for L'Atalante is still somewhat banal. A bored housewife (in this case a barge-wife) who wants to have a little fun while her husband is obsessed with work wasn't a new storyline even in 1934. Instead, it is in the way Vigo tells the story that makes L'Atalante a masterpiece. L'Atalante is a visual poem told through composer Maurice Jaubert's landmark score and Boris Kaufman's dazzling black and white cinematography. Both men would go on to landmark careers: Jaubert worked with many of the masters of French poetic realism until he was killed in action in World War II, and Kaufman had a long career in Hollywood where he worked on films like On the Waterfront (1953) and 12 Angry Men (1956). 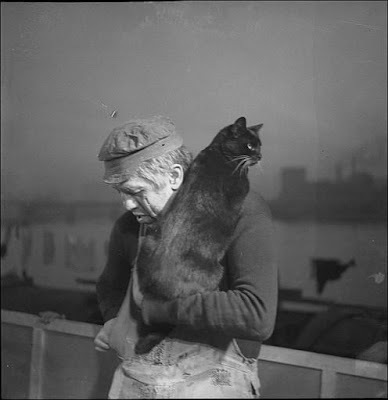 Pere Jules (Michel Simon) and one of his beloved cats in L'Atalante (1934). L'Atalante is a profoundly spiritual film -- Juliette and Jean's connection defies the laws of space and time -- but it is also grounded in earthy details. The film was mostly shot on location on a barge called the Louis XVI, which gives us a very real glimpse into life in thirties France. As the barge slides down the Seine, we see peasants standing on the shoreline and smoke billowing from factories, and we can see how dirty the water in the Seine really is (Dasté, who repeatedly puts his head underwater in one scene, was a very brave man). The twin themes of earth and spirit in L'Atalante are represented by Simon's Pere Jules and Parlo's Juliette. Pere Jules is a uncouth and somewhat lecherous sailor (the concept of dirty laundry is completely foreign to him), who, despite his rough edges and many tattoos, has a heart of gold as shown by his tender love for his many cats. The spirit is represented by Parlo, an angelic beauty who is almost too glamorous to marry a simple barge captain. Pere Jules and Juliette come together in an unusual scene in Pere Jules' cabin where he almost seduces her through his tales of adventure and unusual knick-knacks (Pere Jules keeps the preserved hands of his best friend in a jar), but, in the end, she remains an ethereal and untouchable creature of the spirit. 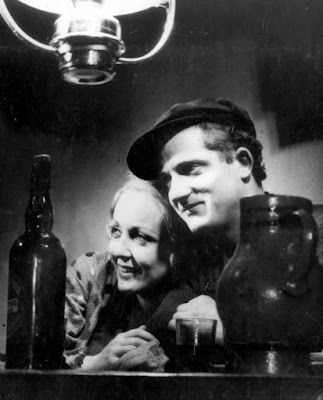 Director Jean Vigo and Dita Parlo on the set of L'Atalante (1934). Vigo, who had tuberculosis, was quite ill during the making of L'Atalante. 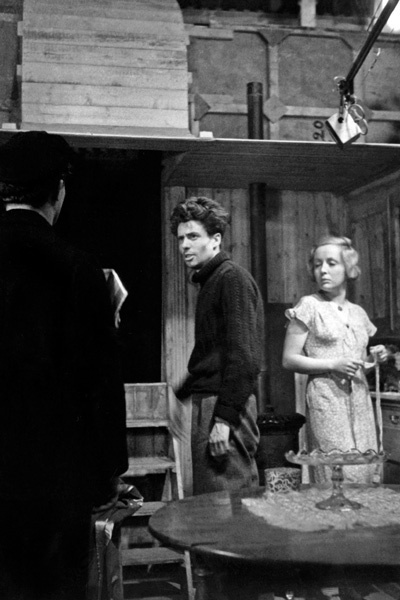 He had to shoot some scenes lying down (L'Atalante is filled with interesting low-angle shots), but his health worsened after the movie's disastrous premiere, and he was unable to protest when the distributor cut about 20 minutes from the film and replaced some of Jaubert's score with a pop song. Vigo died on Oct. 5, 1934, as one of the great unappreciated auteurs of his time. L'Atalante was rediscovered in the 1940's, and it became one of the seminal films that influenced the French New Wave movement. L'Atalante was fully restored to its original running time in 1990 when, miraculously, an unaltered print was found at an Italian broadcasting company. Both New Yorker Films and the Criterion Collection have good quality DVDs of the restored movie. The video below shows director Francois Truffaut talking about Vigo's work. I'll leave you with this fun montage of the many cats in L'Atalante. Vigo was a noted cat lover, legend has it that he was born in a cat-filled attic, and these animals came from the local Society for the Prevention of the Cruelty of Animals. The big-hearted Simon adopted the kitten that is sitting inside the phonograph horn. L'Atalante is available for streaming on Hulu. It is also available on DVD and Blu-ray. Go here for more from my past blogathons. I was intrigued to learn about the director, Jean Vigo. What a shame his life ended so soon... He must have had remarkable artistic vision. Indeed, Vigo was one of cinema's great auteurs even though he only made one feature film. This film does sound amazing, I was saddened to hear about the director's failing health during the production! I love that barges were a pop=culture thing in the 1930s, the things you learn! 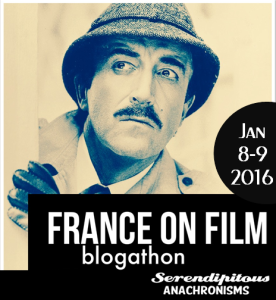 Thank you for such an engaging and insightful post for the France On Film Blogathon!